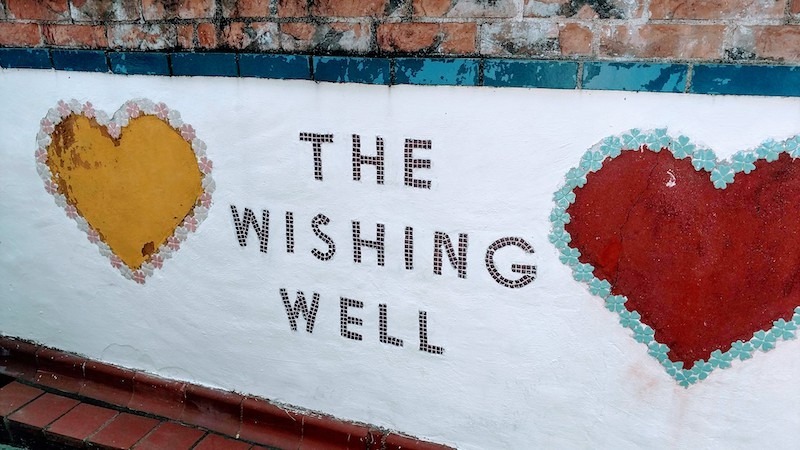 Jeff McKissack incorporated a lot of mosaics into his home, including this sign by a well. I’m not sure I’m passionate enough about anything to dedicate my entire home to it. But two men in Houston did, resulting in the Beer Can House and The Orange Show. Retired postman Jeff McKissack so loved the orange he worked from 1956 to 1980 welding and constructing his home into pathways, exhibits, arenas and walls with mosaic sayings dedicated to the benefits of the fruit. After his death, a non-profit was formed to preserve it and it opened to the public in 1982. In 1984 the foundation commissioned the Fruitmobile, which led to the Houston Art Car Parade. The entrance to The Orange Show, located in a quiet neighborhood in Houston. The Orange Show has various arenas with raised seating, perhaps for shows dedicated to the orange? When in doubt, add a lion to your decor.